Paradise has a owner: Flamengo. To launch its new third jersey, paying tribute to Rio de Janeiro's 450th anniversary, Flamengo forward Marcelo Cirino accepted an invitation from MC Nego do Borel and adidas and saw the beautiful sites of Rio de Janeiro from a special perspective. In a helicopter, they flew over the most important locations in this capital city and launched the new third jersey. The new jersey, which will launch Sunday, March 1, in a classic match between Flamengo and Botafogo, returns to the historic checkerboard style with two quadrants in black and two in red – a reference to the club's first jersey, known as the "Papagaio Vintém". The jersey also includes a blue stripe, in reference to the Rio de Janeiro state flag, as well as a "Rio de Janeiro – 450 years" seal. "Flamengo is an icon of the paradise that is Rio de Janeiro. Nothing could be more fitting, on a date as important as the city's 450th anniversary, than this tribute to Flamengo's fans," says Luiz Gaspar, director of the soccer club category for adidas Brazil. 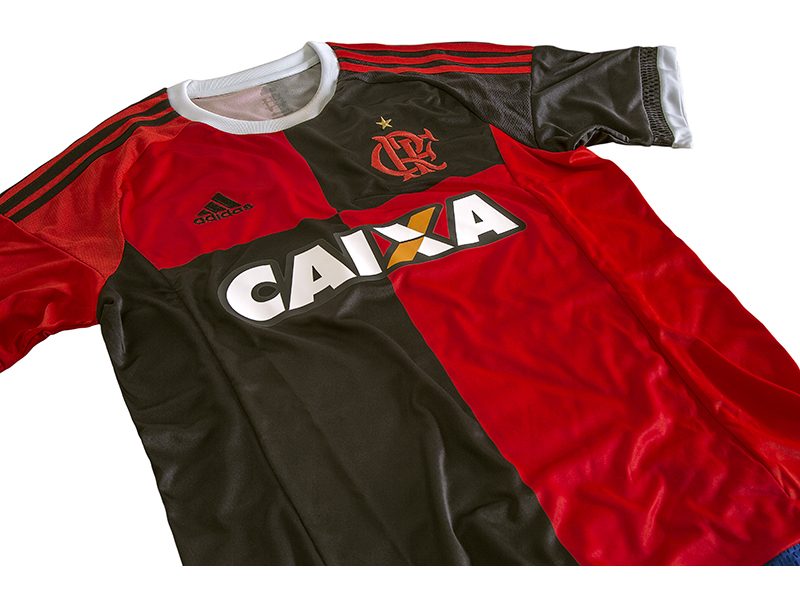 The new jersey is the third tribute from adidas and Flamengo to the city of Rio de Janeiro. The third jersey launched in 2014 included images inspired by locations such as Pão de Açúcar and Corcovado. "Flamengo is an inseparable part of the best moments in Rio de Janeiro's 450 years. Brazil is our home, but Rio is Flamengo's birthplace. Reissuing the classic Papagaio Vintém is a fitting tribute by Flamengo and adidas to this city's history", states Eduardo Bandeira de Melo, president of the club. The design uses adidas' ClimaCool® technology, which takes into account where and how the body produces the most heat and perspiration and uses more breathable fabrics in these regions. As a result, it helps the athlete maintain an ideal body temperature. The new uniform is already available at adidas stores, at www.adidas.com.br/flamengo, official Flamengo stores, and sporting goods retailers throughout Brazil. The jerseys with ClimaCool® technology will cost R$ 249.90, for adult men's sizes, and R$ 199.90 for children's, women's, and mini kit versions.